Offering you a complete choice of products which include complete cutlery set and silver cutlery set. 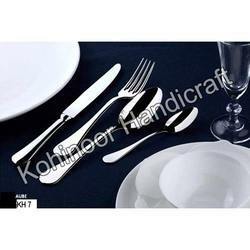 We are one of the creative manufacturers and exporters of Silver Cutlery Set. Available in different vibrant designs and styles, all these sets are elegant in their appeal and look beautiful on the dining table. At our end, we have designed all these sets using supreme quality of metals with a glossy surface finish.